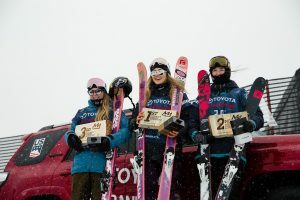 Mammoth Lakes, CA – Whitefish, Mont.’s Maggie Voisin scored her first major win at the Toyota U.S. Grand Prix at Mammoth Mountain on Sunday, topping the ski slopestyle podium for the women in the first qualifying event for the 2018 Olympics. 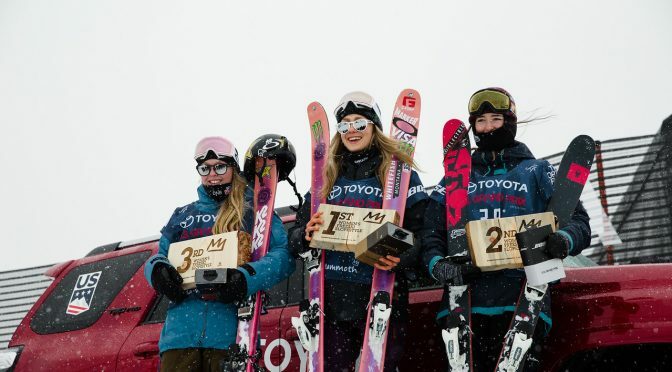 Voisin, who started her season with a second-place podium finish at the Dew Tour in Breckenridge, was thrilled to take her first major win. Her second run scored 80.25: left 270 on, frontside 270 gap on the pyramid, switch on to switch off, switch left 180, right 540 mute, switch left 540 high safety, corked left 900 tailgrab. Voisin stood on the podium with Mathilde Germaud of Switzerland in second and Johanne Killi of Norway in third. Unfortunately, the pattern of week-long challenging weather conditions continued on Sunday and high winds combined with driving snow caused the cancellation of the men’s slopestyle event.